From one angle, writing the proposal is the easy part. The difficulty is when you have to check what you’ve written, cross-reference it against the Request For Proposal, and ensure all parts fit together seamlessly. If you’re writing the document by yourself, you need to find way to check your own work as it’s easy to become ‘snowblind’ when writing. A neutral set of eyes helps identify areas you may have overlooked or sections in the narrative that are unclear and need refining. In other words, don’t proofread your own work if possible. If you have to, create checklists and follow these to the letter. Likewise, if you’re writing the proposal as part of a team, then you need to organize peer reviews. Peer reviews are reviews performed by team members that identify gaps, errors, and omissions in the proposal. 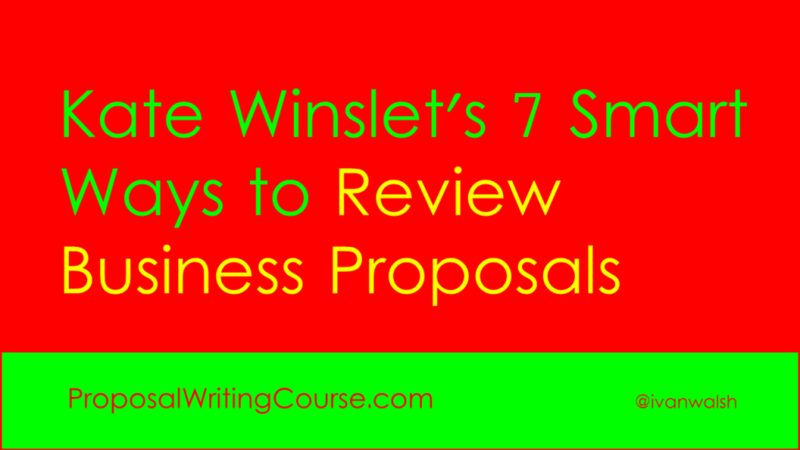 Let’s say you have five writers responding to a grant application or a Request For Proposal. Different writers will be allocated different parts of the response, for example, the technical solution, the project plan, and the costs. When each writer finishes their section, it needs to be reviewed by another person, preferably someone who understands the material and can make informed recommendations. Instead of reading the proposal from start to finish, create a set of guidelines to help the writers understand how to perform the review. Grammar – if you’re writing a bid with team members in different countries, their Microsoft Word documents will be set to local languages. What this means is that when you spell check their work, your spell checker could miss errors and typos. To avoid this, use a proposal template, share this with the team, and encourage them to use a specific language, such as US English. Style – as someone who reviews proposals for a living, I can tell if it’s been written by one person or a team within in a few minutes. How? The style, phrasing, grammar, tone, and voice of the document change from section to section. Is this a bad thing? Not necessary but it suggests that the ‘bid team’ is a set of individuals rather than one unified group. Adopting a common style, encouraging specific phrasing, and highlighting words/terms help avoid this. Technical Accuracy – does the proposed solution answer the requirements? Whoever performs this part of the peer review needs to understand the technology and requirements sufficiently to find potential errors, gaps, or flaws in the design. You also need to check that any technologies which the agency does NOT want or is against are not included in your bid. Sounds obvious but I’ve seen it happen. Project Management – is the project plan accurate? Do the number of days add up? Do the costs associated with the number of man days tally with the Costs section? The project plan needs to be credible, take into account ‘known unknowns’, and allow for contingencies. Project plans that are too aggressive suggest that the bidders are either trying to cut corners or don’t understand the scope of work. Another factor to consider is how the project plan will impact the agency itself. How much of their time will you need? What communication channels will be developed? Costs – the total cost is a critical figure in proposal evaluations. However, you need to outline how you came to these figures. Don’t try to fudge the numbers or disguise how/where you got specific numbers for. In addition, break out the numbers so the assessors can see, at a line item level, how the numbers stack up. For example, include daily rates for all your team members. This demonstrates greater transparency and also allows the agency to compare your rates against other bids. Version Control – when peer reviewing the documents, either with Microsoft Word or PDF, keep track of the different document versions. This ensures that the ‘gold’ copy is submitted and working drafts are archived. In addition, consider setting up a secure location on the network where other members of the bid team can submit their section. Peer reviews are a type of insurance. This protects you from submitting bids that contain errors, flaws, or ambiguities that could easily be corrected. Also, make sure to do a final review for completedness. This means that ALL sections are included in the bid. You’d be surprised when compiling hundred page plus bids, how easy it is to lose a few pages here and there.